It's Lambing time in the Borders. Just a gentle reminder to everyone that hill lambing has either started or is about to start in the Ettrick and Yarrow Valleys, the home of some of the best Wingbeat sites. As you know we have a good reputation with the farmers down here which includes staying away from many of the sites during lambing season to allow ewes to lamb and then settle back on the hill. If anyone is thinking of flying in the Borders it would be appreciated if they could either contact Tommy to check on sites or, at the very least, check with individual farmers before flying. From the 'right to roam' legislation / The Scottish Outdoor Access Code. Farmland: access rights apply to fields but not to grassland being grown for hay or silage if it is above ankle height. Field margins are included in access rights, even if sown with a crop. When crossing arable fields use the tracks or “tramlines” made by tractor wheels, or any unsown ground. Avoid disturbing farm animals, especially where young or aggressive animals are present. Wingbeat have worked on the 'good neighbour' principle for many years which seems to work well. Many thanks from the Wingbeat team and safe flying in 2019. 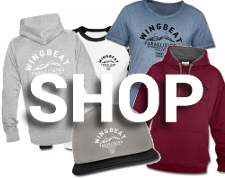 Wingbeat is perhaps one of the smallest paragliding clubs in the UK and is based around the tributaries of the River Tweed in the Teviot, Ettrick and Yarrow Valleys of the Southern Uplands in the Scottish Borders. The club started in the 90’s originating from the local paragliding school, WingBeat, run by Joe and Lyn Campion.The original members of Wingbeat trained with Joe and Lyn and, when Joe left the Borders, retained the name for the club. Wingbeat may be the only club in the UK to have almost more sites than members but this reflects the ‘remoteness’ of the Borders in terms of population and also the excellent relationship we have with local farmers and landowners. It is not unknown for the club to be approached by farmers asking if we can ‘fly’ their hill. Unlike most clubs we do not have a constitution or committee but are just a group of folk with a common love of paragliding and the outdoors. Current members are drawn from the Borders, Dumfries and Galloway, Central Scotland and Ayrshire although you do not have to be Scottish to join an understanding of the local dialect would be helpful so you can join in the craic on the hill!! Local sites are listed elsewhere on the website but many will have heard of ‘Cacra’ or ‘Black Knowe Head’ following visits to one of the many BPC or Scottish Open paragliding competitions that have been hosted by Wingbeat over the years. In the same way the Boston Hall at Ettrick has become synonymous with Wingbeat hospitality even if this does include midges and the odd damp day! Typically the local sites are soft green hills offering an easy walk up from the valley and friendly take offs, some are even top driveable on a good day.There are not many places in the UK that can cater for all wind directions within a twenty mile radius, allow you to fly in dynamic lift, take thermals to base, fly in valley convergence or wait for the evening sea breeze to arrive over St Mary’s Loch. Wingbeat offer everyone a warm welcome to the Borders so why not get in touch if you would like to fly in this part of Scotland.